It is “a damn Edom theology.” Bruce Cresson’s outright summary seems accurate, when one looks into Hebrew Bible’s dominant portrayals of Edom. Once Jacob’s envied brother yet a subjugated nation, if not a vassal, of past is now Israel’s arch enemy, probably because they sided with the Babylonians at Jerusalem’s fall (cf. Ps 137:7; Obadiah 8-15). Isa 63:1-6 seems no exception. The divine warrior coming from Edom exclaims, “I trampled down peoples in my anger, I crushed them in my wrath, and I poured out their lifeblood on the earth” (v. 6). As many English Translations, in their subtitles, grant (cf. NRSV, NIV, etc. ), it is surely the “Vengeance on Edom” that Isa 63:1-6 describes. “Yet, there is more than what meets the eyes,” Irudayaraj asserts in his book. Against “arrestingly gory detail” of the Arriving One, he invites readers to attend to subtlety that the text contains as well as the socio-historical and literary context from which the given pericope originated. He joins scholars who read the text in light of the marginalized context of Yehud. Yet, he does so in a way that no interpreter of the present text has ever done. He employs Social Identity Approach (SIA) to tease out the ambivalent relationship that the returned Yehud community had with the Edomites who encroached on what previously Juduhite territory. In order to elucidate this contesting situation Irudayaraj utilizes, first, a category, proximate “other”, “a proximate neighbor who is persistently ‘othered’” (6). Second, he employs the Iconographic Exegesis (IE), through which “identity construction” and “theological identity revival” take place respectively (8). His contention is that “reading Isa 63:1-6 in its contested and marginal postexilic context, the image of the blood-spattered Treader (v. 3; cf. v. 6) and the unrelenting animosity towards Edom (v. 1) together function as a cipher for the prophetic revival of theological and social identities of the Yehud community” (5). Chapter 1, “‘Trito-Isaiah’ and the Text,” first explicates socio-historical context of Trio-Isaiah wherein the returnees had to contend with “those who remained; the foreigners who have moved in” and had to face the harsh reality of “the considerably reduced boundary of the land; mixed religious practice; and the towns in ruins” (13). It was a contested and marginal situation. Irudayaraj also deftly describes how notable theological themes point to the experience of returnees. They are still in exile – postexilic exile – and still waiting for salvation of Zion. Yet, they are also assuring God’s salvation to the “Servants of Yahweh” (cf. Isa 65:9) and even extending it to foreigners and eunuchs (Isa 56;66). Such ambivalent attitude of the Trito-Isaiah towards the nations is the lens through which Isa 63:1-6 is explored in the subsequent chapters. Chapter 2, “Social Identity Approach and Proximate Other”, introduces Tajfel’s Social Identity Theory (SIT) and Turner’s Self-Categorization Theory (SCT) succinctly and ties them to the main category of the project, proximate “other.” Why does Edom, a subjugated nation of the past which was perhaps no longer extant, still appear in Isaian corpus? What are the boundary markers that separate returnees from the Edomites? Why do returnees still cling to criticizing Edom? Irudayaraj attempts to answer those questions by delineating three aspects of the proximate “other” – persisting category, permeable boundary, and ambivalence. He argues that in an agonistic context social creativity took place. Marginalized returnees began comparing themselves not with Persians, the dominant “other,” but with Edom, the proximate “other” and thus constructing their own identity. I find this chapter particularly thought provoking, because vicious conflict occurs mostly with one’s neighbors – whether it is neighboring countries or religious communities. It is an insight worth pondering, since degrading the “other” linguistically and/or non-linguistically not only relegates the status of outgroup but also enhances that of ingroup in ingroup’s discursive rhetoric. Chapter 3, “Coming From Edom: Ambivalent Depictions,” begins a SIA reading of Isa 63:1-6. Irudayaraj bespeaks how the text can be read as an agonistic discourse in which a sentinel challenges and the divine warrior responds at the border, a contested space. In particular, he draws attention to the fact that the locus of coming is Edom and that v. 1 should retain “stooping” (in his great might) instead of “marching.” These pointers challenge the picture of violent God by presenting the redeemer with the mark of the exiles. This reading leaves seemingly opposite depictions – stooping vs. great strength (v. 1) – of the Coming One in tension rather than aiming for a resolution. Irudayaraj’s approach is particularly apt considering that Isa 63:1-6 is poetry. The text is rich with subtleties, ambiguities, and ambivalence and meant to be left as such. An effort to nail down one way of reading – either accepting gory depictions or disregarding the text altogether – can do violence of ignoring what the text has to offer. Chapter 4, “The Trampling One: Descriptions of Marginality,” explores how marginal communities revive their identity by describing a relegated deity as a victor. Particularly fascinating is Irudayaraj’s juxtaposition of Kālī and Grāmadevatā, with the trampling one coming/arriving from Edom. Stories of two former deities, who are female, marginalized, and yet violent, stand in solidarity with their worshippers, the marginalized people of India. So does the Arriving One, who comes alone (v. 3) and has no helper (v. 5), with returnees. Irudayaraj employs Iconographic Exegesis (IE) to make a case that what the seemingly violent text portrays is neither collective-merrymaking trampling at the winepress nor crushing of enemies often found in the images of Ancient Near East, but laborious treading of a lonely peasant. In reviving the identity of its deity, Irudayaraj argues, the marginalized Yehud community manages to revive its own identity. 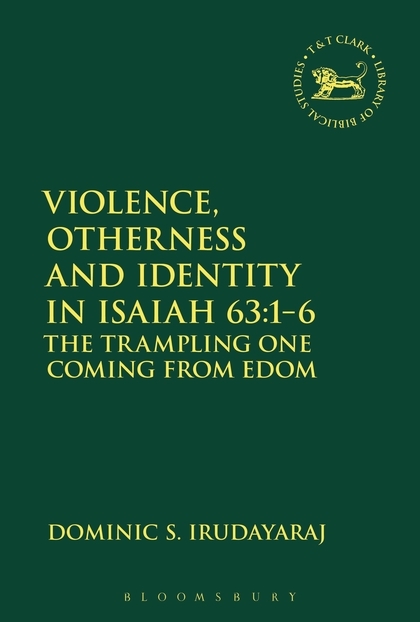 Chapter 5, “Otherness, The Ultimate And The Proximate: Correlated And Revived Identities,” attempts at bringing SIA and IE readings together by focusing on the theme, “otherness.” Irudayaraj draws attention to Isaiah’s depiction of its God, the ultimate “other”—mighty, yet marginalized—and Edom, the proximate “other” who persists in Israel’s effort to construct their own identity. I found this chapter, supposedly the crescendo of his book, intriguing. The text is not the fatal blow to Edom, but validation of its existence. Edom is the locus from which Israel’s redeemer comes. Thus, Irudayaraj states, “a strange ‘outsider’ becomes the ‘insider’” (150). Chapter 6, “Retrospect and Prospect,” briefly revisits the study conducted in the preceded chapters and presents implications of the project for the New Testament studies and the Indian context. Irudayaraj reiterates that the animosity and denigration against outgroup is reflective not so much of actual historical events as an in-group’s identity revival in a marginal context. Isa 63:1-6 is such an effort to identify Yehud community with their mighty, yet marginalized redeemer. In close, Irudayaraj invites readers to acknowledge such contested voices—violent and marginal depictions—present in the scripture and to explore interpretive possibilities, as in an oratorio, which creates marvelous renditions by letting “loud and soft; agreeing and dissenting” (169) voices coexist. I find Irudayaraj book worth reading, because, first, he listens to muffled voices of the text, pays attention to ambiguities and ambivalence within the text, and lets contesting voices coexist. Second, he demonstrates that exploring one’s own socio-cultural and religious tradition can shed fresh light on a seemingly problematic text. Third, he explores how methodological innovation (cf. SIA and IE) can expand and deepen understanding of the ancient text. Yet, his approach leaves lingering questions on my part. God is still clearly the trampling one whose action crush and people and pour out their lifeblood (v. 6). Even God’s lonely presence may bespeak God not in-need but in no-need, as Deutero-Isaiah repeatedly made monotheistic claims previously (cf. Isa 43:11). I think that discussing continuity rather than discontinuity between Deutero-Isaiah and Trito-Isaiah would be fruitful endeavor to add complexity within the given text. Nevertheless, I highly recommend Irudayaraj’s book to scholars as well as students of the Bible because of its scholarly scrutiny and relevance. His discussion on proximate “other” in particular uncovers our innate nature to degrade “them”—who are different from and disagreeing with us—to enhance the self-esteem of “us.” It has something to say about the religious and racial conflicts that have happened and are still happening near and far. By constantly making who is (supposed to be) close kin “other,” often in the name of their God, people try to regain dominance that they think they used to possess. Irudayaraj’s book is a wakeup call for all of us to acknowledge such danger lurking in us and an invitation to find ways to live together in peace in spite of our disagreements and differences. Leaving aside the theological and social jargon employed by the author, the reviewer has summed up the book beautifully. The Bible can never be analyzed threadbare because the thread that unites it is God. So, humans! Be satisfied with the patterns of salvation than the problems of salvation. The chiefest problem is this. Why is the tribe of Judah placed above the others who have been sidelined little by little? BUT. Every time Israel is mentioned the number ‘twelve’ is used for the tribes. I can’t understand how even the tribes of Joseph and Benjamin can be set aside? AND the tribe of Judah was not that much holy, were they? So. Problems ad infinitum. Relish the Bible, or perish!